Dear friends, the Church rejoices with the canonization of its new saints, Blesseds Vincenzo Grossi, Maria dell’Immacolata Concezione, Ludovico Martin and Maria Azelia Guérin during the Mass yesterday October 18, 2015 in St. Peter’s Square. 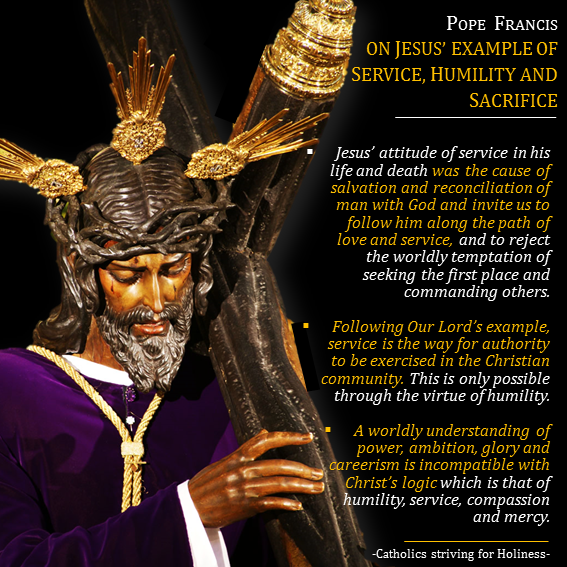 During the homily Pope Francis centered his thoughts on Jesus’ example of SERVICE which is only possible through HUMILITY and SACRIFICE, following Our Lord’s example who came to serve and not to be served and give his life as a ransom for many (Cf. Mk 10:45). Jesus’ attitude of service in his life and death was the cause of salvation and reconciliation of man with God and invite us to follow him along the path of love and service, and to reject the worldly temptation of seeking the first place and commanding others. Following Our Lord’s example, service is the way for authority to be exercised in the Christian community. This is only possible through the virtue of humility. Jesus enjoys dominion because He is a servant, glory because he is capable of abasement, kingship because he is fully prepared to lay down his life. A worldly understanding of power, ambition, glory and careerism is incompatible with Christ’s logic which is that of humility, service, compassion and mercy. Let us ask God through the intercession of the new saints to help us grow in the spirit of service, overcoming our pride and love of comfort, thus imitating Our Lord’s example who came not to be serve but to serve. Below is the Vatican- provided translation of the Pope’s homily taken from zenit.org (TITLES AND CAPS MINE). Happy reading and a blessed week ahead! Cordially inviting you to like http://www.facebook.com/CatholicsstrivingforHoliness and share oír posts to help more people un their Christian faith and life. Thanks and God bless! Fr. Rolly Arjonillo. Jesus is the Servant of the Lord. His life and death, marked by an attitude of utter service (cf. Phil 2:7), were the cause of our salvation and the reconciliation of mankind with God. The kerygma, the heart of the Gospel, testifies that his death and resurrection fulfilled the prophecies of the Servant of the Lord. Saint Mark tells us how Jesus confronted the disciples James and John. Urged on by their mother, they wanted to sit at his right and left in God’s Kingdom (cf. Mk 10:37), claiming places of honour in accordance with their own hierarchical vision of the Kingdom. Their horizon was still clouded by illusions of earthly fulfilment. Jesus then gives a first “jolt” to their notions by speaking of his own earthly journey: “The cup that I drink you will drink… but to sit at my right hand or at my left is not mine to grant, but it is for those for whom it has been prepared” (vv. 39-40). With the image of the cup, he assures the two that they can fully partake of his destiny of suffering, without, however, promising their sought-after places of honour. His response is to invite them to follow him along the path of love and service, and to reject the worldly temptation of seeking the first place and commanding others. 3. SERVICE IS THE WAY FOR AUTHORITY TO BE EXERCISED IN THE CHRISTIAN COMMUNITY. THIS IS ONLY POSSIBLE THROUGH THE VIRTUE OF HUMILITY. 4. JESUS ENJOYS DOMINION BECAUSE HE IS A SERVANT, GLORY BECAUSE HE IS CAPABLE OF ABASEMENT, KINGSHIP BECAUSE HE IS FULLY PREPARED TO LAY DOWN HIS LIFE. Each of us, through baptism, share in our own way in Christ’s priesthood: the lay faithful in the common priesthood, priests in the ministerial priesthood. Consequently, all of us can receive the charity which flows from his open heart, for ourselves but also for others, and become “channels” of his love and compassion, especially for those who are suffering, discouraged and alone. The men and women canonized today unfailingly served their brothers and sisters with outstanding humility and charity, in imitation of the divine Master. Saint Vincent Grossi was a zealous parish priest, ever attentive to the needs of his people, especially those of the young. For all he was concerned to break the bread of God’s word, and thus became a Good Samaritan to those in greatest need. Saint Mary of the Immaculate Conception, drawing from the springs of prayer and contemplation, devoted her life, with great humility, to serving the least of our brothers and sisters, especially the children of the poor and the sick. (October 18, 2015) © Innovative Media Inc.
POPE FRANCIS: God’s love for us is boundless that He is always waiting and searching for us.